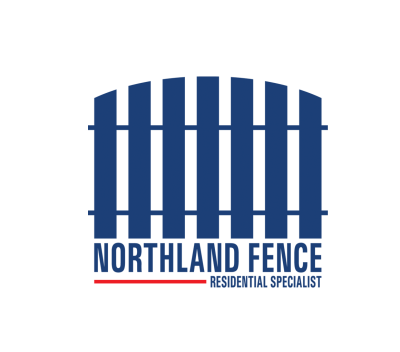 Northland Fence is proud to be the leader in post installation innovation. Our driven post technique not only prevents our posts from heaving but also gives our vinyl fences the strongest posts in the business. 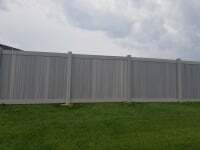 Northland Fence leads the way using galvanized steel posts driven 48" below grade and then sleeves that post with a 5" x 5" vinyl post. This guarantees our posts will never heave from our tough Minnesota frozen ground. Also, you won't have to dispose of dirt or see cement footings around posts. So clean it looks like we were never there! All of our vinyl sections are broken down into 8 feet or less in length. Vinyl privacy pickets have a thickness of 7/8" x 6' wide compared to our competitor's cheap 5/8" thickness and 11' wide giving their fence more wind drag and eventual fence failure. We offer white & tan vinyl fences but also carry woodland select non-textured and certagrain textured vinyl fences. 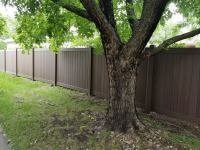 The most common and affordable fence style is our tongue & groove vinyl privacy fence. Our vinyl fence gate sizes are 48" or 60" wide and are square to work with flat terrain. If your ground is sloped, we also offer custom angled gates to follow the slope of the land. Our hardware comes with a powder-coated metal hinge and latch. 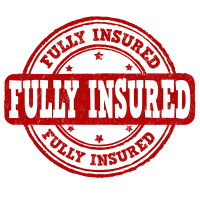 When the unexpected happens make sure you have the right company that stands behind their fence products. 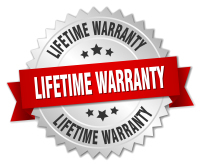 Our vinyl fences come with a 5-year warranty on labor and a lifetime warranty on materials.